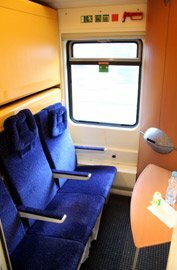 UK to Poland by train from €99.80! UK citizens no longer need a visa to visit Poland. 21 December 2018. Train times valid 9 Dec 2018 to 14 Dec 2019. Option 1 is to travel from London to Berlin on day 1, stay overnight in Berlin, then take a Berlin-Warsaw EuroCity train to Warsaw next day. It's potentially the cheapest option, as you can travel from London to Warsaw from as little as €98 plus the cost of an overnight hotel in Berlin. Option 2 involves exactly the same route, trains & fares as option 1, but with the overnight stop in Brussels rather than Berlin. That way, you can leave central London in the evening after the working day has finished, and be in Warsaw the following evening. Option 3 is the cheapest option. Although not the fastest, it's actually pretty time-effective: London to Brussels on any evening Eurostar you like from £44, overnight hotel in Brussels, Brussels to Prague next day for an amazing €21, then the sleeper to Warsaw from €29. Option 4 is the ferry alternative to Eurostar. 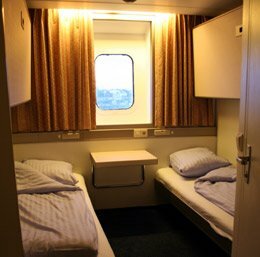 Travel from London to Amsterdam overnight by train & ferry with a comfortable private en suite cabin on the Harwich-Hoek van Holland ferry, then take onward trains to Poland. By all means go out one way and back another. 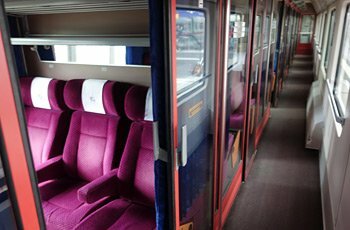 Incidentally, the Jan Kiepura sleeper train between Cologne & Warsaw was sadly discontinued in December 2016, so there are now no sleeper options. Option 1, London to Warsaw by daytime trains with hotel in Berlin. Day 1: Travel from London to Berlin by Eurostar to Brussels, ICE or Thalys to Cologne and ICE train to Berlin, using any of the several daytime options shown on the London to Germany page. For example, you can leave London St Pancras at 10:58 arriving Berlin Hbf at 21:06. Stay overnight in a hotel in Berlin. The 3-star Meininger Hotel or InterCity Hotel are ideal as they are right next to Berlin Hbf and a 10-minute walk from the Reichstag or a 15-minute walk from the Brandenburg Gate, relatively inexpensive and get good reviews. If you want to push the boat out, try the famous & historic Hotel Adlon Kempinski Berlin right next to the Brandenburg Gate. If you're on a tight budget, try the cheaper Motel One Berlin-Hauptbahnhof just behind the station or see www.hostelworld.com. Day 2: Travel from Berlin to Warsaw by EuroCity train, leaving Berlin Hbf at 09:37 and arriving Poznan at 12:23 and Warsaw Centralna at 16:15. 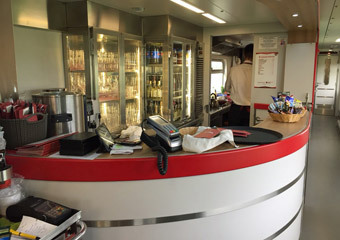 The Berlin-Warsaw EuroCity train is a comfortable air-conditioned train with trolley refreshment service and a restaurant car serving drinks, snacks and full meals. Treat yourself to a meal in the restaurant: Three courses, a beer and a coffee only come to around €11. Alternatively, on Mondays-Saturdays there's an earlier EuroCity train if you prefer, leaving Berlin Hbf at 06:37 and arriving Poznan at 09:23 and Warsaw Centralna at 12:55. Why not spend some time in Berlin? It's just a 10 minute walk from Berlin Hbf to the restored Reichstag and Brandenburg Gate. There are later trains to Warsaw, right up to a 16:43 departure daily except Saturdays, arriving Warsaw Centralna at 23.06. You can check times at www.bahn.de. Day 1: Travel from Warsaw to Berlin on any suitable Warsaw-Berlin EuroCity train. You can leave Warsaw Centralna daily at 12:50 or Poznan at 16:31 arriving Berlin Hbf at 19:16. Or daily except Saturdays there's a later EuroCity train leaving Warsaw Centralna at 15:55 or Poznan at 19:31 arriving Berlin Hbf at 22:16. 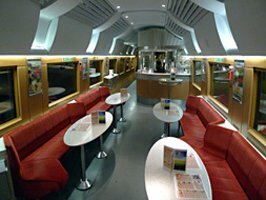 The Warsaw-Berlin EuroCity train is a comfortable air-conditioned train with trolley refreshment service and a restaurant car serving drinks, snacks and full meals. Treat yourself to a meal in the restaurant: Three courses, a beer and a coffee only come to around €11. 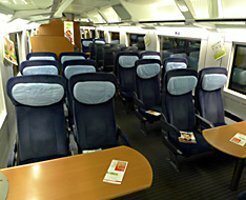 Day 2: Travel from Berlin to London by ICE train from Berlin Hbf to Cologne Hbf, ICE train to Brussels Midi and Eurostar to London St Pancras, using any of the several daytime options shown on the London to Germany page. For example, you can leave Berlin Hbf at 06:50 arriving London at 16:05 or you can leave Berlin at 10:50 arriving London St Pancras at 19:57 (21:33 on Saturdays & some other dates). It's up to you. How much does it cost? London to Warsaw from €98! London to Berlin can cost as little as €69.90 each way in 2nd class or €129.90 in 1st class with a Sparpreis London fare from Germany Railways. The price varies, book early and pick your date carefully for the cheapest prices. Berlin to Warsaw by EuroCity train starts at €29.90 each way in 2nd class, or €59.90 in 1st class. Step 1, check the price of Sparpreis London fares between London and Berlin using these special links. I strongly recommend registering when prompted, as you can then log in and check or re-print tickets whenever you like, from any PC. Booking usually opens 92 days ahead, you can't book before bookings open. You print your own ticket. Sparpreis London fares have limited availability, as German Railways only have a small allocation on Eurostar. 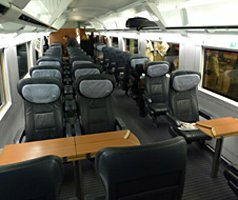 If you cannot find availability from London to Berlin, try booking the same trains, but using www.eurostar.com for the London to Brussels part and www.bahn.de for Brussels to Berlin. Alternatively, try www.b-europe.com for London to Cologne and www.bahn.de for Cologne to Berlin. If you'd prefer to book all these trains by phone, just call Deutsche Bahn's UK phone line on 08718 80 80 66 (lines open 09:00-20:00 Monday-Friday, 09:00-13:00 Saturday & Sunday, no booking fee, 2% credit card charge, no charge for debit cards). Custom-made travel arrangements: A hassle-free option is to get a train tour specialist such as Railbookers to arrange your whole trip, with train tickets, hotels and transfers all sorted with one phone call. As you're then in effect booking a package, they'll take care of you if there's a strike or major delay, for example. Just tell them when and where you want to go, and they'll create the best rail-based tour or holiday for you. Escorted tours: If you'd like to travel with a convivial group of travellers escorted by a professional tour guide, contact Great Rail Journeys at www.greatrail.com, in the UK call 01904 527 120. They have escorted tours from the UK to Warsaw & Krakow by train with departures on various dates. Take a virtual tour inside an ICE. 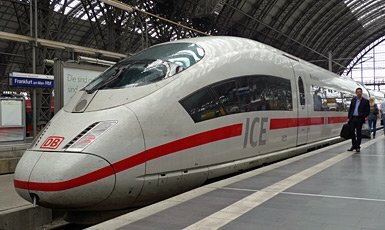 More information about these ICE trains. This is similar to option 1, but with the overnight stop in Brussels rather than Berlin - which can be more time-effective if you can leave London after the end of the working day, and arrive in Warsaw the following evening. Feel free to go out using option 1, back using option 2, or vice versa. 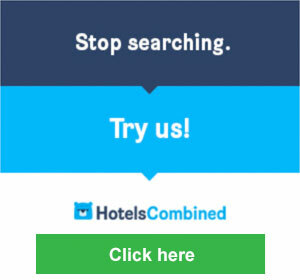 Just book everything as one-way. This option runs from London daily except Saturdays, from Warsaw daily except Sundays. Day 1, travel from London to Brussels by Eurostar on any departure you like. The last train goes at 19:34, journey time just 2 hours. Stay overnight in Brussels. The good & inexpensive Ibis Brussels Midi is just across the road from Brussels Midi station. The Pullman Hotel Brussels Midi is a more upmarket option and it's part of the station complex itself. Day 2, travel from Brussels to Berlin by comfortable ICE train, leaving Brussels Midi daily except Sunday mornings at 06:25, making one quick and easy change at Cologne Hbf and arriving Berlin Hbf at 13:07. You have time for lunch in Berlin, and perhaps a wander from the station to the Reichstag & Brandenburg gate, 10-15 minutes walk away. Day 2 afternoon, travel from Berlin to Warsaw by EuroCity train, leaving Berlin Hbf at 16:43 and arriving Poznan at 19:23 and Warsaw Centralna at 23:06. Day 1, travel from Warsaw to Berlin by EuroCity train, leaving Warsaw Centralna at 05:48 or Poznan at 09:31 arriving Berlin Hbf at 12:16. You have time for lunch in Berlin, and perhaps a quick wander from the station to the Reichstag & Brandenburg gate, 10-15 minutes walk away. Day 1, travel from Berlin to Brussels on ICE trains, leaving Berlin Hbf at 14:50, making one simple change at Cologne Hbf and arriving Brussels Midi at 21:35. Times may vary. Stay overnight in Brussels. For an inexpensive hotel close to Brussels Midi station I recommend the Ibis Brussels Midi just across the road. The Pullman Hotel Brussels Midi is a more upmarket option and part of the station complex itself. Day 2, take any morning Eurostar you like from Brussels Midi to London. The first train is usually at 06:56 on Mondays, arriving London 07:59, at 07:56 on Tuesdays-Saturdays arriving London 08:59 or at 08:52 on Sundays arriving London 09:57. 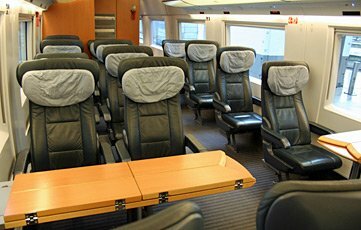 London to Berlin can cost as little as €69.90 each way in 2nd class or €129.90 in 1st class with a Sparpreis London fare from Germany Railways - you can programme in an overnight stop in Brussels. The price varies, book early and pick your date carefully for the cheapest prices. First book from London to Berlin one-way at the German Railways website www.bahn.de - I have set up this special link for you with the necessary parameters. It'll find a Eurostar from London around 18:00. If you want an earlier departure from London simply set an earlier departure time, click Add intermediate stops and increase the stopover duration in Brussels by the same number of hours. You print your own ticket. Then book Berlin to Warsaw one-way or return also at the German Railways website www.bahn.de. If you're coming back, now book from Berlin to London one-way at www.bahn.de - I have set up this special link for you with the necessary parameters. It may suggest a change at Aachen instead of Cologne, that's fine. If you want the option I suggest, click Add intermediate stops and set up the enquiry with a first stop at Cologne with zero duration and a 2nd stop at Brussels with (say) 9 hour duration. Adjust stopover time in Brussels to get the Brussels-London Eurostar departure you want. Alternatively, you can of course book the Eurostar separately at www.eurostar.com, then book Brussels-Berlin at www.bahn.de and Berlin-Warsaw at www.bahn.de, although this may work out slightly more expensive. Option 3, via Brussels & Prague - the cheapest route! OK, so this isn't the fastest route or the simplest route with fewest changes. But it's the cheapest, thanks to an unbelievably cheap €21 Brussels-Prague fare offered by Czech Railways, added to a cheap €29 fare from Prague to Warsaw. There is nothing second-rate about the quality of the trains (see the photos below), and a night-day-night journey taking up just one day is quite time-effective. So what's not to like? Worth considering! 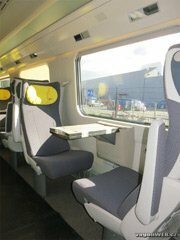 Day 1, travel from London to Brussels on any evening Eurostar you like. The last one leaves London St Pancras at 19:34 arriving Brussels Midi at 22:38 but by all means take an earlier one for a pleasant evening in Brussels. Stay overnight in Brussels. I recommend the inexpensive Ibis Brussels Midi, just across the road from Brussels Midi station. Alternatively, the Pullman Hotel Brussels Midi is a more upmarket option and part of the station complex itself. 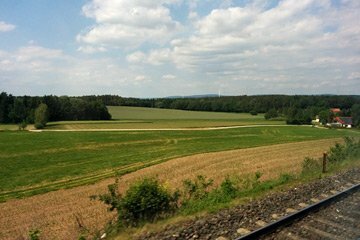 It involves 4 trains, but all on one inclusive cheap ticket and there's nothing cut-rate about these trains: You take top-quality high-speed ICE trains from Brussels to Frankfurt & Frankfurt to Nuremberg with bistro-restaurant car, then a swish air-conditioned regional train from Nuremberg to Cheb and from Cheb to Prague. Tip: When boarding the train from Nuremberg to Cheb, make sure you join the portion for Cheb, as another portion goes to Hof. Have dinner in Prague... The Restaurant Šalanda (www.restauracesalanda.cz) is at the station, just inside the modern station's main front entrance, but it gets so-so reviews. Consider a 6 minute 550m walk to the Restaurant Zvonice (www.restaurantzvonice.cz) which gets great reviews, see walking map. It's open until late, ideal if you're catching the sleeper. Feedback appreciated. Step 2, travel from Prague to Warsaw by sleeper train, leaving Prague Hlavni at 22:15 and arriving Warsaw Centralna at 09:14 next morning. This train has a modern air-conditioned sleeping-car with 1, 2 & 3 bed sleepers with washbasin, and a couchette car with 4 & 6 berth compartments. Morning tea or coffee is included in the fare in the sleepers. Alternatively, stay overnight in Prague and catch a daytime train from Prague to Warsaw next day, see the Prague-Warsaw info here. Hotels with good reviews next to the station include the Esplanade Hotel (good choice, stayed there myself), Falkensteiner Hotel Maria, Chopin Hotel. Day 1, take the sleeper train from Warsaw to Prague, leaving Warsaw Centralna at 19:30 and arriving Prague Hlavni at 07:31 next morning. This train has a safe & comfortable air-conditioned sleeping-car with 1, 2 & 3 bed sleepers with washbasin, and a couchette car with 4 & 6 berth compartments. Morning tea or coffee is included in the fare in the sleepers. 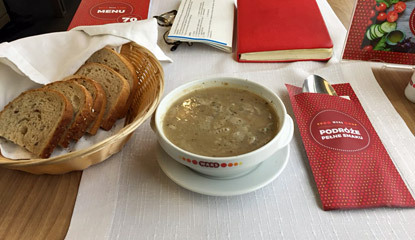 Have a full breakfast in Prague. Alternatively, take a daytime train from Warsaw Centralna to Prague Hlavni, see the timetable here. Then stay overnight in Prague, hotels with good reviews next to the station include the Esplanade Hotel (good choice, I've stayed there myself), Falkensteiner Hotel Maria, Chopin Hotel. Day 2, travel from Prague to Brussels by train from just €21, leaving Prague Hlavni at 10:33, change Cheb, Nuremberg & Frankfurt arriving Brussels Midi at 21:35. If you took a day train from Warsaw to Prague and stayed in Prague overnight, you can travel on an earlier departure if you like, leaving Prague Hlavni at 06:33, change Cheb, Nuremberg & Frankfurt arriving Brussels Midi at 17:35. 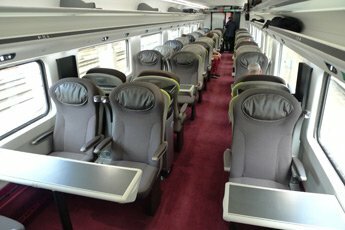 There's nothing cut-rate about these trains: You travel on a swish air-conditioned regional express train from Prague to Cheb and from Cheb to Nuremberg, then by top-quality high-speed ICE train from Nuremberg to Frankfurt and Frankfurt to Brussels, complete with bistro-restaurant cars and beer on tap. Stay overnight in Brussels. I recommend the Ibis Brussels Midi, just across the road from Brussels Midi station. Alternatively, the Pullman Hotel Brussels Midi is a more upmarket option and part of the station complex itself. Day 3, travel from Brussels to London in 2 hours on any morning Eurostar you like. You can arrive in London as early as 08:57 on weekdays, for example. 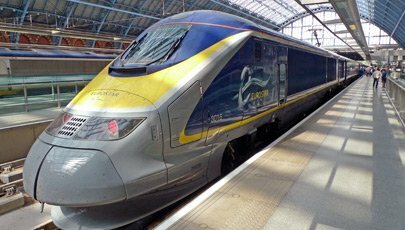 London to Brussels by Eurostar starts at £44 one-way or £58 return in 2nd class, £112 one-way or £168 return in 1st class. Book well in advance for the cheapest prices. Brussels to Prague starts at just €21 each way if you book as shown below at the Czech Railways site. You can often find this price even a week ahead. Or go 1st class from around €40. Prague to Warsaw by sleeper starts at €29 with couchette in 6-berth, €39 with couchette in 4-berth, €39 with a bed in a 3-bed sleeper or €49 with a bed in a 2-bed sleeper or around €75 with a single-bed sleeper all to yourself. 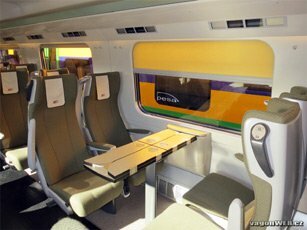 Prague to Warsaw by daytime EuroCity train starts at €28 in 2nd class or €48 in 1st class. Step 1, buy a Eurostar ticket from London to Brussels at www.eurostar.com. You print your own ticket. Step 2, now use the Czech Railways website www.cd.cz to book from Brussel to Prague, but (and this is the important bit) you must click More options then click Travel via and put Cheb in the via box. Look for journeys with 3 changes with a cheap price of around 560 CZK. You print your own ticket. See my tips for using cd.cz. Step 3, now use the Czech Railways website www.cd.cz again to book from Prague to Warsaw, looking for the direct sleeper train marked No transfers (EN) or a direct daytime train marked No transfers (EC). You print your own ticket, although it must be stamped by a Czech (CD) conductor or ticket office before it is valid in Poland. The easy & relaxed interchange at Cheb station... The red train on the left is the German regional train just arrived from Nuremberg. You cross to the blue Czech train on the right about to leave for Prague. Photo courtesy of Lennart Verbraeken. The fastest & cheapest way to travel between London & Krakow is via Warsaw, shown in detail below. Alternatively, it can be cheaper and only a bit longer to travel via Prague, so why not combine the two great cities of Prague & Krakow in one flight-free trip? If you also want to visit the museum at Auschwitz, or in Polish, Oswiecim, see here. Day 1, travel from London to Berlin by Eurostar & luxurious German ICE train as shown on the London to Germany page. You can use any option you like, for example you can leave London St Pancras at 10:58 and arrive Berlin Hbf at 21:06. Stay overnight in Berlin. The 3-star Meininger Hotel or InterCity Hotel are ideal as they are right next to Berlin Hbf and a 10-minute walk from the Reichstag or a 15-minute walk from the Brandenburg Gate, relatively inexpensive and get good reviews. If you want to push the boat out, try the famous Hotel Adlon Kempinski Berlin is right next to the Brandenburg Gate. More hotels in Berlin. If you're on a tight budget, try the cheaper Motel One Berlin-Hauptbahnhof just behind the station or see www.hostelworld.com. Day 2: Travel from Berlin to Warsaw by EuroCity train, leaving Berlin Hbf at 09:37 every day and arriving at Warsaw Centralna at 16:15. 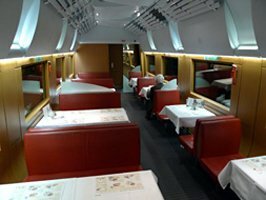 The Berlin-Warsaw EuroCity train is a comfortable air-conditioned train with trolley refreshment service and a restaurant car serving drinks, snacks and full meals. Treat yourself to a meal in the restaurant: Three courses, a beer and a coffee come to €11. Day 2 afternoon, travel from Warsaw to Krakow by air-conditioned InterCity (EIC) train, leaving Warsaw Centralna at 16:50 and arriving Krakow Glowny at 19:19. 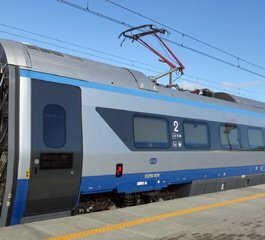 There's also a top-quality bullet-nosed InterCity Premium (EIP) train leaving Warsaw Centralna 17:45 and arriving Krakow Glowny at 20:00 if you'd like a longer connection. You can check times at www.intercity.pl. 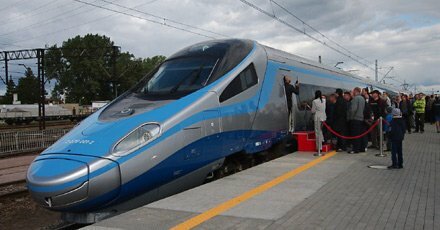 Day 1, travel from Krakow to Warsaw by air-conditioned bullet-nosed InterCity Premium (EIP) train, leaving Krakow Glowny at 09:56 and arriving Warsaw Centralna at 12:15. You can check times at www.intercity.pl. Day 1: Travel from Warsaw to Berlin on any suitable Warsaw-Berlin EuroCity train. You can leave Warsaw Centralna daily at 12:50 arriving Berlin Hbf at 19:16. 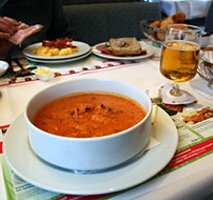 If you'd like lunch in Warsaw there's a later EuroCity train train at 15:55 daily except Saturdays arriving Berlin Hbf at 22:16. Day 2, travel from Berlin to London as shown on the London to Germany page. You can use any option you like, for example you can leave Berlin Hbf at 06:51 and reach London St Pancras at 16:05, or at 10:51 reaching London at 19:57 (21:03 on Saturdays). London to Berlin starts at €69.90 each way in 2nd class, €129.90 each way in 1st class, buy tickets as shown on the London to Germany page. Berlin to Krakow starts at €39.90 each way in 2nd class, €69.90 in 1st class. Buy tickets online at the German Railways website www.bahn.de and print your own ticket. This covers both trains on one ticket. However, to see this route you need to click Add intermediate stops and enter Warsaw to force it to find these cheap fares via Warsaw by train not bus. I have set up this link with the necessary parameters, just enter your date of travel & passenger details. If you don't see any cheap fares from Berlin to Krakow for any reason, assuming it's within 60 days of travel, simply book from Berlin to Warsaw at www.bahn.de from €39, allow at least 45 minutes in Warsaw between trains, then book Warsaw to Krakow separately for around €20 at Polish Railways www.intercity.pl. Introduced in December 2014, these are the very best trains on the Polish network are modern bullet-nosed pendolinos like this. They operate on the Krakow-Warsaw-Gdynia route at up to 125mph, with faster operation planned in the future. Reservation is compulsory and they have a bar-bistro car - for more photos see www.vagonweb.cz/fotogalerie/PL/PKP_ED250.php. 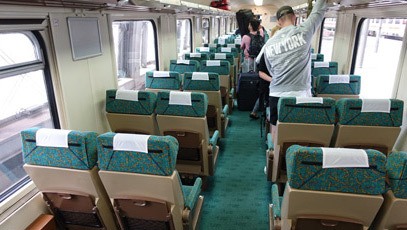 Above right, 2nd class seats. You' also find comfortable air-conditioned locomotive-hauled EIC trains on the Warsaw-Krakow route, and a few much older and slower TLK trains. I recommend choosing an EIP or at least EIC! This takes a bit longer and involves a few more changes, but it's the cheapest option thanks to amazingly cheap Brussels-Prague and Prague-Krakow tickets sold by the Czech Railways website and it only involves 3 tickets, all easily bookable online. 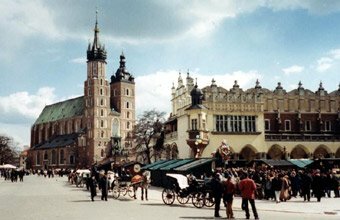 And it's pretty time-effective, taking just one daytime day out of your schedule at each end of your stay in Krakow, and might save you a hotel night or two in Krakow given the morning arrival and evening departure. With an evening in Brussels, dinner in Prague, and high-quality air-conditioned trains with a comfy sleeper at night, what's not to like? Day 2, travel from Brussels to Prague, leaving Brussels Midi at 08:23 weekdays or 08:25 at weekends, changing at Frankfurt, Nuremberg & Cheb and arriving at Prague Hlavni at 19:19. 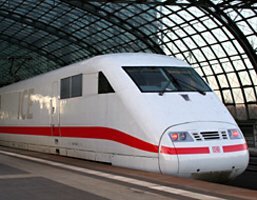 The journey involves top quality high-speed ICE trains with bistro-restaurant car Brussels-Frankfurt-Nuremberg and comfortable air-conditioned regional trains Nuremberg-Cheb-Prague. You've time for dinner in Prague. On Mondays-Saturdays you can leave Brussels two hours earlier if you like, at 06:25, for a longer evening in Prague. Day 2 evening, travel from Prague to Krakow by comfortable overnight Czech sleeping-car. leaving Prague Hlavni at 22:15 every day, arriving at Oswiecim (Auschwitz) at 04:51 and Krakow Glowny at 06:17 next morning (day 3 from London). 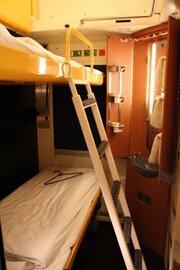 The sleeping-car has cosy 1, 2 & 3-bed compartments with washbasin, see photos, tips & information on the Prague to Krakow by train page. There's also a couchette car with 4-berth & 6-berth compartments. Alternatively, stay overnight in Prague and catch the daytime EuroCity train Cracovia from Prague to Krakow next morning (day 3), see dates of operation, timetable & information on the Prague to Krakow by train page. By all means stop off in Prague! Hotels with good reviews next to the station include the Esplanade Hotel (good choice, I've stayed there myself), Falkensteiner Hotel Maria, Chopin Hotel. Day 1, travel from Krakow to Prague by comfortable direct Czech sleeping-car, leaving Krakow Glowny at 22:36 or Oswiecim (Auschwitz) at 23:56 and arriving at Prague Hlavni at 07:31 next morning (day 2). 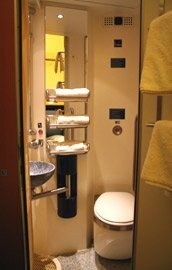 The sleeper has cosy 1, 2 & 3-bed compartments with washbasin, see photos, tips & information on the Prague to Krakow by train page. There's also a couchette car with 4-berth & 6-berth compartments. Alternatively, you could leave Krakow in the morning on the daytime EuroCity train Cracovia from to Prague, see dates of operation, timetable & information on the Prague to Krakow by train page. Then stay overnight in Prague, hotels with good reviews next to the station include the Esplanade Hotel (good choice, I've stayed there myself), Falkensteiner Hotel Maria, Chopin Hotel. Day 2, travel from Prague to Brussels, leaving Prague Hlavni at 10:45, changing at Cheb, Nuremburg and Frankfurt Flughafen, arriving Brussels Midi at 21:35. 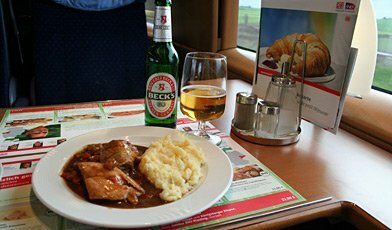 The journey involves comfortable regional trains Prague-Cheb-Nuremberg and top quality high-speed ICE trains with bistro-restaurant car Nuremberg-Frankfurt-Brussels. London to Brussels starts at £44 one-way or £58 return. Fares work like air fares, so book early for the cheapest prices. 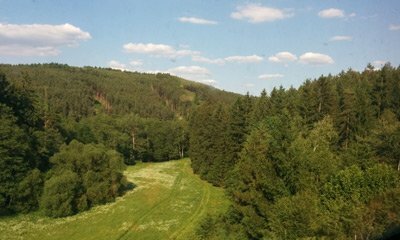 Brussels to Prague starts at an amazing €21 each way in 2nd class or €40 in 1st class if you buy at the Czech Railways website. This is an advance-purchase First Minute fare, but you can often find this price even booking just a week in advance. How can CD do such a cheap ticket? Who knows, but they do! Prague to Krakow starts at €29 each way with couchette in 6-berth, €39 with couchette in 4-berth, €39 with a bed in a 3-bed sleeper or €49 with a bed in a 2-bed sleeper or around €75 with a single-bed sleeper all to yourself. However, it's a bit more complicated than that, see full details of costs on the Prague to Krakow by train page. Prague to Krakow on the daytime train Cracovia starts at just €19. 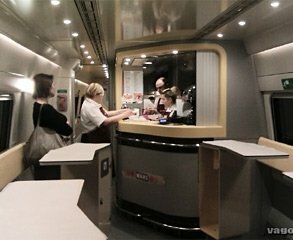 Step 1, book from London to Brussels at www.eurostar.com and print your own ticket. Step 2, book from Brussels to Prague at the Czech Railways website www.cd.cz (select English then eshop) and print your own ticket, but - and this is the important bit - to see the cheap First Minute fares you need to enter Cheb in the via box. You print your own ticket. Step 3, now book the Prague to Krakow sleeper also at the Czech Railways website www.cd.cz - there's a knack to this, see full details of how to book this train on the Prague to Krakow by train page. Lunch in an ICE3 bistro car. A Czech sleeping-car of the sort used on the Prague-Krakow overnight train. Standard sleeper set up as a 2-berth, with blind down & washstand open. Each room can be used with 1, 2 or 3 beds. Deluxe sleepers are virtually identical to standard ones, but with a tiny bit more floorspace & compact shower & toilet. 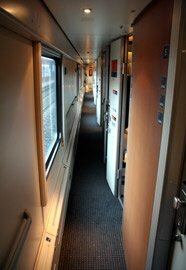 Just like a hotel, the corridor in a Comfortline sleeping-car. There's a shower at end of the corridor for standard sleeper passengers. If you are visiting the museum at Oswiecim, better known by its infamous German name, Auschwitz, you travel to Krakow as shown above then take a local train. Regular local trains link Krakow with Oswiecim every hour or two, see www.bahn.de" to check train times. Auschwitz I was an ex-Polish army barracks in the town itself about 20 minutes walk from the station -turn right outside the station then veer left. Auschwitz-Birkenau II was a purpose-built concentration camp a little way out of town, about 25 minutes walk from the station (turn right, then turn right again at the first major road bridge across the railway). There are also regular buses between Krakow and Oswiecim, see www.busy-krk.pl/en/how-to-get-to-auschwitz.php. Day 1, travel from London to Berlin by Eurostar & luxurious German ICE train as shown on the London to Germany page. You can use any option you like, for example you can leave London at 10:58 and arrive Berlin Hbf at 21:06. Stay overnight in Berlin. The 3-star Meininger Hotel is ideal as it's right next to Berlin Hbf and a 10-minute walk from the Reichstag or a 15-minute walk from the Brandenburg Gate, it's inexpensive and gets good reviews. If you want to push the boat out, try the famous Hotel Adlon Kempinski Berlin is right next to the Brandenburg Gate. More hotels in Berlin. If you're on a tight budget, see www.hostelworld.com. Day 2, travel from Berlin to Łódź by train leaving Berlin Hbf at 09:37 by Berlin-Warsaw EuroCity train, change at Poznan (arrive 12:23, depart 12:50) and arrive Łódź Kaliska at 16:35. Check times for your date of travel at www.bahn.de. Day 1, travel from Łódź to Berlin by train, leaving Łódź Kaliska at 13:27, changing at Poznan (arrive 16:26, depart 16:31) and arriving Berlin Hbf at 19:16. Check times for your date of travel at www.bahn.de. Stay overnight in Berlin. The 3-star Meininger Hotel is right next to Berlin Hbf and a 10-minute walk from the Reichstag or a 15-minute walk from the Brandenburg Gate, it's inexpensive and gets good reviews. If you want to push the boat out, try the famous Hotel Adlon Kempinski Berlin is right next to the Brandenburg Gate. More hotels in Berlin. If you're on a tight budget, see www.hostelworld.com. Berlin to Łódź costs from €29.90 each way booked in advance. Buy tickets online at the German Railways website www.bahn.de. Shockingly, there are now no trains between Berlin and Wroclaw. The last direct train was discontinued from December 2014. You now need to travel via Poznan on daytime trains with an overnight stop in Berlin. Or take daytime trains to Dresden and one of several daily Dresden to Wroclaw local trains. Day 1, travel from London to Dresden from €69.90 by Eurostar and connecting trains: Full details of times, fares & how to buy tickets are shown in the London to Dresden section on the Germany page. Stay overnight in Dresden. Find hotel near the station in Dresden. Day 2, travel from Dresden to Wroclaw Glowny (= main station) by local train. There are several a day, journey time 3h55, you can easily look up times at www.bahn.de. No reservation is necessary or possible, just buy a ticket at the station and hop on. The fare is likely to be around €35. Day 1, travel from Wroclaw to Dresden on one of several daily local trains, journey 3h55. You can easily look up times at www.bahn.de. No reservation is necessary or possible, just buy a ticket at the station and hop on. Fare likely to be around €35. Day 2, travel from Dresden to London from €69.90 by ICE trains and Eurostar: Full details of times, fares & how to buy tickets are shown in the London to Dresden section on the Germany page. 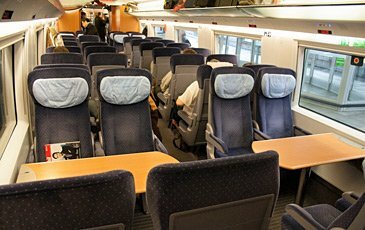 Day 1, travel from London to Berlin from €69.90 in 2nd class or €129.90 in 1st class by Eurostar and connecting ICE trains: Full details of times, fares & how to buy tickets are shown in the London to Berlin section on the Germany page. Day 2, travel from Berlin Hbf to Wroclaw Glowny (= main station) from €29.90 in 2nd class or €59.90 in 1st class by taking the Berlin Warszawa Express to Poznan and changing for a train to Wroclaw. The 06:37 Mondays-Saturdays will get you to Wroclaw at 12:16 with a change in Poznan. The daily 09:37 will get you there at 15:28 also with a change in Poznan, or there are later trains. You can check times & buy tickets at the German Railways site www.bahn.de using this special link which adds Poznan in the via box. Day 1, travel from Wroclaw to Berlin €29.90, using a Polish train to Poznan and changing onto a EuroCity train to Berlin. There's one leaving Wroclaw at 13:42, change at Poznan, arriving Berlin Hbf at 19:16, or there are earlier trains for a longer evening in Berlin, just watch that you don't risk any tight connections. You can check times & buy tickets at the German Railways site www.bahn.de using this special link which adds Poznan in the via box. I recommend at least 45 minutes for connections in Poznan, if it suggests a less time than this you can use the adjust transfer time feature. Day 1, travel from London to Berlin as shown on the London to Germany page. You can use any option you like, but the best connection and most time-effective option leaves London on day 1 at 19:34, stopping overnight in Brussels and taking the 06:25 Mondays-Saturdays train from Brussels to Cologne and on to Berlin on day 2, arriving Berlin Hbf at 13:06. Day 2, a direct air-conditioned EuroCity train leaves Berlin Hbf at 14:37, arriving Gdansk Glowny at 20:23 and Gdynia at 20:51. A bistro car is available for dinner, treat yourself! A full meal with beer will costs little more than €11. See the Berlin-Warsaw EuroCity page, as this is an identical train that is part of the same service. There are regular trains every hour or two from Berlin Lichtenburg to Szczecin Glowny, journey time 1h49 to 3h30, just use www.bahn.de to find train times & tickets for your date of travel. You can also go from Berlin Hbf to Szczecin with one change en route, see www.bahn.de. Day 1, take the direct air-conditioned EuroCity train leaving Gdynia Glowna at 07:09 or Gdansk Glowny at 07:34 and arriving Berlin Hbf at 13:16. A restaurant car is available for breakfast and lunch, treat yourself! There are regular trains from Szczecin to Berlin every hour or two usually with one simple change, journey time 2h30 to 3h30, just use www.bahn.de to find train times & tickets for your date of travel. Travel from Berlin to London as shown on the London to Germany page. You can use any option you like, but the best and most time-effective option is to leave Berlin Hbf at 14:50 on day 1, stop overnight in Brussels and arrive in London at 08:57 (09:57 on Sundays) on day 2. But by all means have some time in Berlin and use the 17:49 with an overnight stop in Cologne arriving London at 11:57 (12:57 on Sundays) on day 2. For details of fares and how to buy tickets from London to Berlin from €69.90 each way, see the London to Germany page. Berlin to Gdansk costs from €39.90 in 2nd class or €59.90 in 1t class booked in advance at www.bahn.de. Berlin to Szczecin costs €30.70 each way if you book online at www.bahn.de. However, if you wait until you reach Berlin, you can use the self-service machines to buy a Berlin-Stettin ticket for just €10, valid from any Berlin urban area station to any rail station, tram or bus stop in the Szczecin urban area, on any train including IC and EC trains. You should select Stettin, not Szczecin, as your destination on the machines to see the Berlin-Stettin ticket appear. To reach Zakopane at the foot of the famous Tatra mountains, first travel from London to Krakow using any of the options shown in the London to Krakow section above. Then travel from Krakow to Zakopane by train, using www.bahn.de to find train times. There's a train every few hours, journey time is about 3 hours 30 minutes, and it's a very scenic run. You can buy a Krakow to Zakopane ticket at the station in Krakow. You can also check times at www.intercity.pl. ... and this is a Captain's Class cabin with double bed & complimentary bubbly in the minibar. 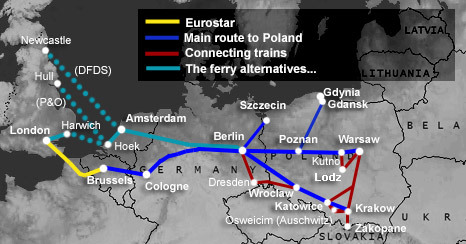 You might prefer to travel by train & ferry to reach Poland, for example to avoid the Channel Tunnel if problems affect the Eurostar service or if you suffer from claustrophobia. It's also cheaper if you have to travel at short notice when Eurostar can be expensive. This route is also handy if you live in East Anglia as you can travel direct to Harwich avoiding London. 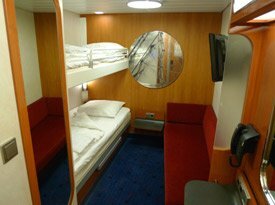 Indeed, you may simply prefer a relaxing journey, cruising overnight on the Stena Line superferry in a luxury en suite cabin with shower, toilet, satellite TV and free WiFi (see the video), heading for Berlin by train, overnighting there then travelling on to Warsaw next morning. Day 1, evening: Travel from London to Amsterdam overnight by Dutch Flyer train & ferry service. You leave London's Liverpool Street station daily at 19:32 by train to Harwich International. 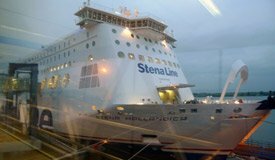 At Harwich, the station is right next to the ferry terminal and you walk off the train into the terminal, check in at the Stena Line desk and walk straight onto the Stena Line ferry to Hoek van Holland. All passengers travel in cosy private cabins with en suite toilet, shower & satellite TV. 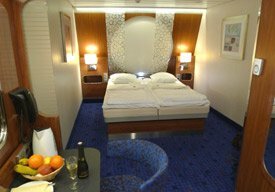 Deluxe Comfort class & Captains class cabins are also available, and there's free WiFi in the lounges, bars & restaurants on 9 deck. You can get on board the ferry before 9pm, have a late dinner in the restaurant and settle into your cabin. The ferry sails at 23:00 and arrives at Hoek van Holland at 08:00 Dutch time next morning. On arrival at Hoek van Holland you walk down the gangway, through passport control and out of the ferry terminal straight onto the station. Take the temporary rail replacement bus running every 20 minutes (until a date in 2018) or frequent metro train (from a date in 2018 onwards) to Schiedam Centrum and change onto for an InterCity train to Amsterdam Centraal, arriving 10:55. See the Netherlands page for full details. Dutch Flyer tickets are valid not just from London but from any Abellio Greater Anglia railway station, for example, Cambridge, Norwich or Chelmsford. Day 2, spend some time exploring Amsterdam. Left luggage lockers are available at Amsterdam Centraal. Day 2, afternoon: Take the 15:00 Intercity train from Amsterdam Centraal to Berlin Hbf arriving 21:22, with bistro car. Or take an earlier train and enjoy an evening in Berlin, for example the 11:00 from Amsterdam arrives 17:22 or the 13:00 from Amsterdam arrives 19:22. The Reichstag is only 10 minutes walk from Berlin Hbf, the Brandenburg Gate just 15 minutes walk. Stay overnight in Berlin. The 3-star Menninger Hotel is ideal as it's right next to Berlin Hbf and a 10-minute walk from the Reichstag, it's inexpensive and gets good reviews. If you want to push the boat out, try the famous Hotel Adlon Kempinski Berlin is right next to the Brandenburg Gate. If you're on a tight budget, see www.hostelworld.com. Day 3, take any Berlin-Warsaw EuroCity train from Berlin to Warsaw, the first one leaves Berlin Hbf at 06:37 Mondays-Saturdays arriving Warsaw Centralna at 12:55, or have a leisurely breakfast and take the daily 09:37 arriving at 16:15. A bistro car is available. Change in Warsaw for Krakow, trains link these cities regularly in around 2h20, check times at www.intercity.pl. Day 1, travel from Warsaw to Berlin by EuroCity train. Daily except Saturdays you can leave Warsaw Centralna at 15:55 and arrive Berlin Hbf at 22:16. Or on any day of the week you can leave Warsaw Centralna at 12:50 and arrive Berlin Hbf at 19:16. A bistro car is available. Day 2, take an Intercity train from Berlin Hbf to Amsterdam Centraal with bistro car. One leaves at 08:34 arriving 15:00, or you can take the 10:34 arriving 17:00. Day 2, evening: Travel from Amsterdam to London overnight by Dutch Flyer train & ferry service. You take the 18:34 train from Amsterdam Centraal to Schiedam Centrum and change onto the temporary rail replacement bus running every 20 minutes (until a date in 2018) or frequent metro train (from a date in 2018 onwards) to Hoek van Holland Haven. At Hoek, the station is right next to the ferry terminal. Walk onto the ferry and sail overnight in a snug private cabin to Harwich. The ferry sails at 22:00 and arrives at Harwich International at 06:30 next morning, UK time. Take a train on to London next morning (day 3 from Warsaw) arriving between 08:48 & 08:59. See the Netherlands page for full details. Important update: Buses are replacing trains between Schiedam Centrum & Hoek van Holland from 1 April 2017 while the line is converted to light rail. New frequent metro trains will start running from a date in 2019. More details here. London to Amsterdam starts at £55 per person each way, plus the cost of a cabin. Cabins start at £34 for a single berth cabin or £45 per cabin for a 2-berth, and are compulsory on the night sailing. The fare covers the train from London to Harwich, the ferry, and onward Dutch trains from Hoek van Holland Haven to any station in the Netherlands, see the Netherlands page for full details of fares and cabin types and costs. Amsterdam to Berlin by intercity train starts at €39 each way in 2nd class or €69 in 1st class. Berlin to Warsaw by EuroCity train starts at €29.90 each way in 2nd class or €59.90 in 1st class. Step 1, buy a Dutch Flyer train & ferry ticket from London to Amsterdam as shown on the Netherlands page. Step 2, now go to www.bahn.de and book from Amsterdam to Berlin and back. You print your own ticket. Step 3, now use www.bahn.de again to book from Berlin to Warsaw and back. You print your own ticket. If you live in the North of England or Scotland, the fastest option is to take a train up to London and travel from London to Poland using Eurostar, as described above. If you choose this option, see this advice on buying cheap connecting train tickets to London. But there are some useful ferry alternatives which allow you to by-pass London, and spend a day in Amsterdam on the way. DFDS Seaways run an excellent daily overnight cruise ferry from Newcastle to Amsterdam, and P&O Ferries run a daily overnight cruise ferry from Hull to Rotterdam. So take the overnight ferry to Holland, head onwards by train to Berlin, and after an evening and night in the German capital, hop on a morning train to Poland! Day 1, take a train to either Hull or Newcastle, whichever is most convenient for where you live. 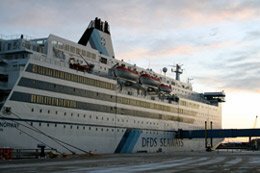 Transfer to the P&O overnight cruise ferry from Hull to Rotterdam or the DFDS Seaways cruise ferry from Newcastle to IJmuiden, the port of Amsterdam. 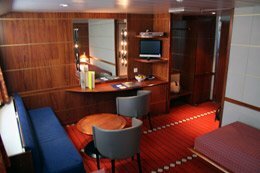 Both ferries have bars, restaurants & comfortable en suite cabins, arriving next morning. For details of timetables, fares & how to buy tickets for travel to Amsterdam via each of these ferry routes, see the Netherlands page. Day 2, have lunch or a wander round in Amsterdam, all the sights are easy walking distance from Centraal station. Left luggage lockers are available. Day 2, afternoon: Take the 15:00 Intercity train from Amsterdam Centraal to Berlin Hbf arriving 21:22, with bistro car. Or take an earlier train and enjoy an evening in Berlin, for example the 11:00 from Amsterdam arrives 17:22, the 13:00 arrives 19:22. The Reichstag is only 10 minutes walk from Berlin Hbf, the Brandenburg Gate just 15 minutes walk. Day 3, take any Berlin-Warsaw EuroCity train from Berlin to Warsaw, the first one leaves Berlin Hbf at 06:37 Mondays-Saturdays arriving Warsaw Centralna at 12:55, or have a leisurely breakfast and take the daily 09:37 arriving Warsaw Centralna at 16:15. A bistro car is available on board. Day 2 early evening, travel overnight by cruise ferry either with P&O Ferries from Rotterdam to Hull or with DFDS Seaways from IJmuiden (near Amsterdam) to Newcastle, whichever is most convenient for where you live. Next morning (day 4) transfer to the station and take a train home. For full details of train & ferry times and how to buy tickets for each of these routes, see the Netherlands page. Amsterdam to Berlin by intercity train starts at €39 each way in 2nd class or €69 in 1st class. Book this at www.bahn.de and print your own ticket. Berlin to Warsaw by EuroCity train starts at €29 each way in 2nd class or €49 in 1st class. Book this at www.bahn.de and print your own ticket. You can book Polish inter-city train tickets (but not international ones except to Berlin) online at the Polish Railways InterCity website, www.intercity.pl. At www.intercity.pl the English button is top right, and you'll need to use the Polish spellings of Krakow and Warszawa. You pay online with a credit card and print out your own ticket. Many seat61 correspondents have reported success buying self-print tickets for Polish trains this way, using UK and Dutch credit cards. Polish train ticketing agency www.polrail.com comes highly recommended if you want to arrange train tickets within Poland in advance, or book international train tickets starting in Poland, for example, from Warsaw to Prague, Vienna, Budapest, Moscow, Kiev, Lviv or Vilnius, or from Krakow to Prague, Budapest or Vienna, etc.. You should arrange tickets between 10 & 60 days before travel (Polish train reservations open 60 days before departure, but 10 days is necessary for the agency to buy and send tickets). Tickets can be couriered to your home address in any country, or they can arrange ticket collection within Poland, for example, at your hotel. If you use their services, feedback is always welcome! A recommended journey planner for all Polish trains, including local ones (for example, those linking Krakow with Oswiecim (Auschwitz) see http://rozklad.sitkol.pl/bin/query.exe/en. Definitely take a good guidebook. For the independent traveller, I think this means one of two guidebooks, either the Lonely Planet or the Rough Guide. Both series are excellent. You can buy an in-depth guide for Poland or a guide covering all the countries in Eastern Europe. If your budget will stretch, the excellent Polonia Palace Hotel is a top choice. It's just across the road from both the Palace of Culture skyscraper and Warsaw Centralna station, and 25 minutes walk from Warsaw's old town. Opened in 1913, it was one of the few hotels to emerge unscathed from WW2, and has been used by many famous people including General (later President) Eisenhower and General de Gaulle. It provides very high quality rooms, but at a budget price by western European standards. Check prices & book. In the mid- to upper-budget range, Warsaw's most prestigious and historic luxury hotel is the Hotel Bristol, opened in 1901 right next to the old town. It also survived the bombing of the old town in WW2, being used as the German HQ. Check prices & book. www.tripadvisor.com is a good place to browse independent travellers' hotel reviews. If you want a holiday to Krakow or Warsaw by train not plane, but want someone else to organise all the train tickets & hotels for you, one specialist company can do just that, for a holiday with no airport hassles and no long days in cramped coach seats on motorways. Railbookers can custom-make a flight-free holiday to Poland for you, with train travel & hotels, for however long you like, leaving on any date you like. For example, they suggest a 6 night trip from London to Krakow, Warsaw & Berlin. Indeed, they can arrange trains and hotels for any tour of eastern Europe to your own specification. They take good care of their clients, and I have no hesitation in recommending them.